I would like to take a moment to thank my friends, old and new, for their kind sentiments and condolences after the great losses we have endured. This year has been a difficult one, to be certain. However, I am much comforted by the fact that so many people care. In time I will remember Shenanigan, Frances, Duchess and Jenny without tears. Thank you so much for your support and understanding. 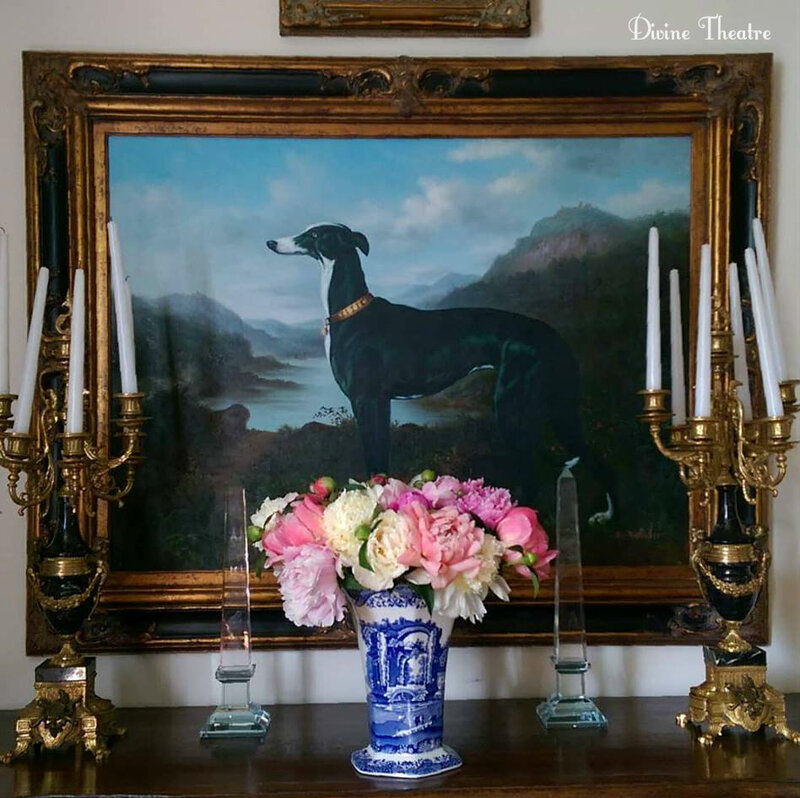 I have been keeping very busy upholstering chairs (wait until you see them), painting furniture, making cushions and drapes, laying carpeting, adding to the gardens and acquiring more stuff! 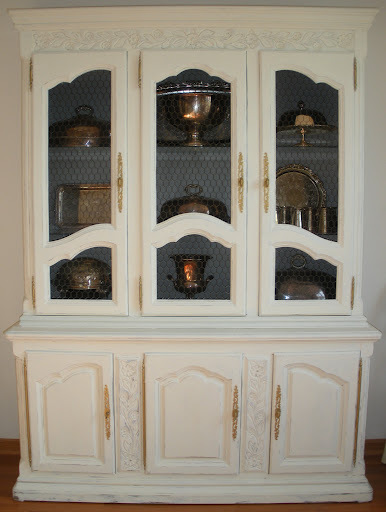 I decided that the buffet deux corps I had in the Dining Room wasn't what I really wanted. 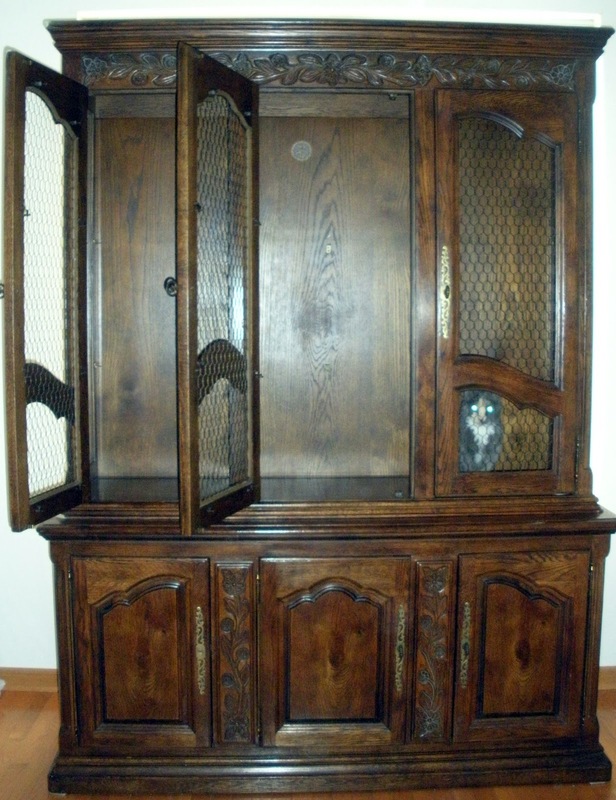 I posted it on Craigslist and sold it to a man from Transylvania (!) He loved it so much he is actually having it shipped there when he moves at the end of the month! 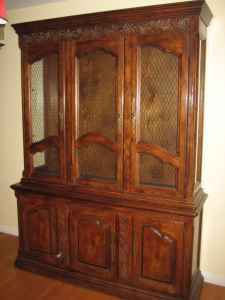 The china cabinet, purchased on Craigslist for $50. It is 5 1/2 feet long and 7 feet tall...a rather large piece. It was damaged in transit but with a bit of wood glue, wood putty and sandpaper I was able to repair it. *Note to self*...listen to husband when he tells me the kids who respond to my "Movers Wanted" ad on Craigslist are stoners, (habitual marijuana users). He's trained in that kind of stuff. They just seemed really pleasant and calm! 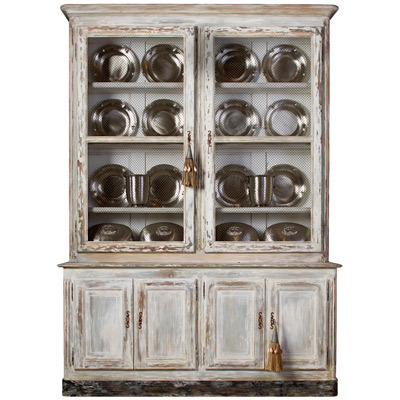 I had to bail them out of jail and get their truck out of impound before I could get my china cabinet. They were driving without valid insurance. When they explained it to me, I felt sorry for them! More later on how I hired them a second time and they started my armoire on fire. But I digress. Here is my beloved Jenny, trying to convince me to paint the interior "Jenny Grey". I followed her advice. I had to pull her out four times! 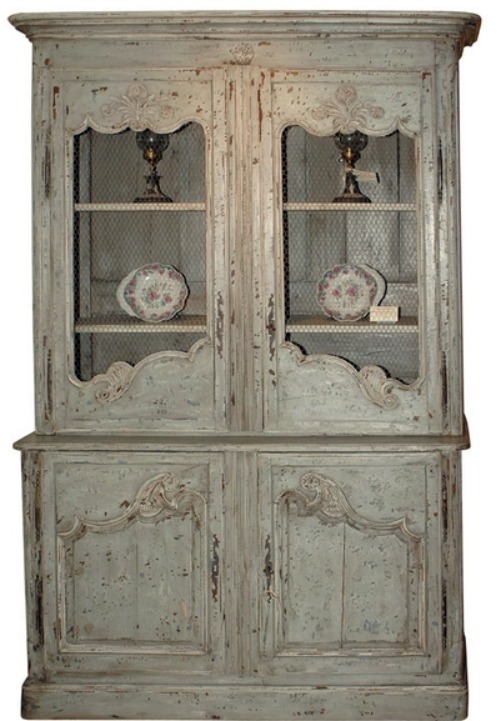 The interior was painted "Jenny Grey"(actually, Annie Sloan French Linen) and waxed with Annie Sloan Clear Wax. 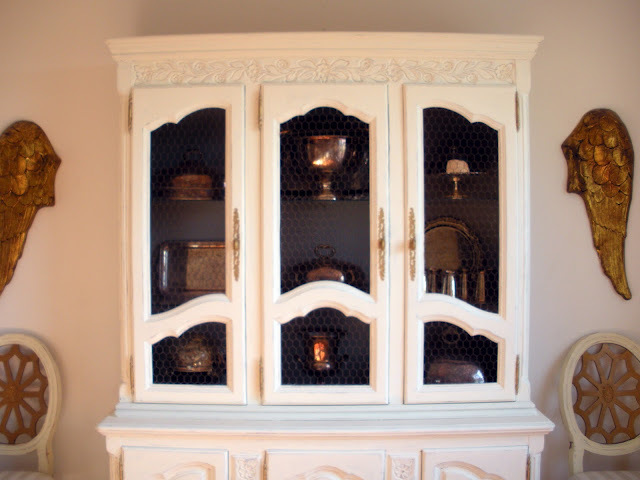 I carefully removed the glass panels behind the chicken wire, then painted the entire piece with Annie Sloan Old White. 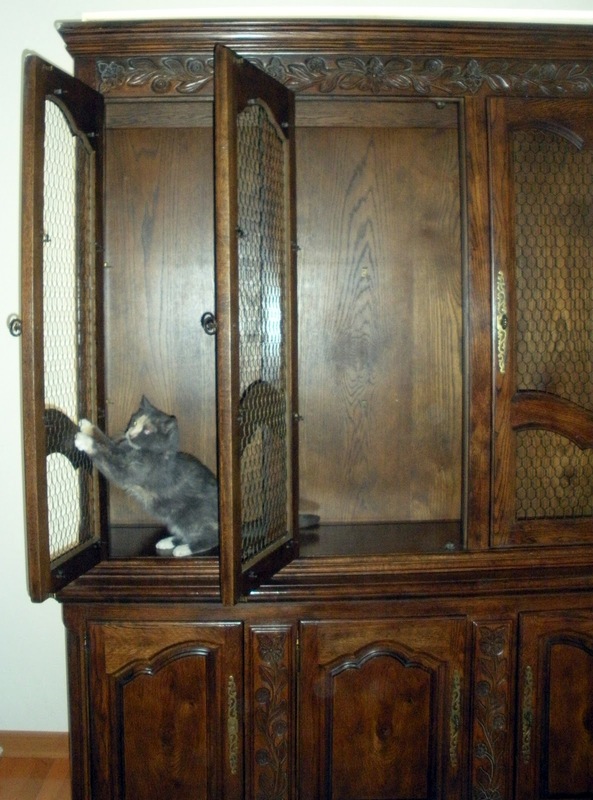 The sides of the hutch were glass. I painted them and let them dry thoroughly in between coats. It took four coats to cover the glass. 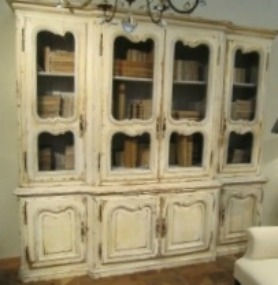 I wanted it to look like the antique bookcases I admired. 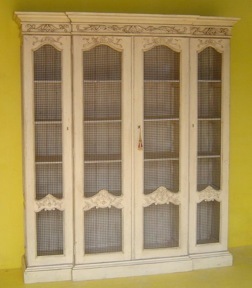 Closer view of the hutch. It is lacking detail. That will change with the application of Annie Sloan Dark Wax. I took a small brush and painted all the hardware with Rub N' Buff Gold Leaf. 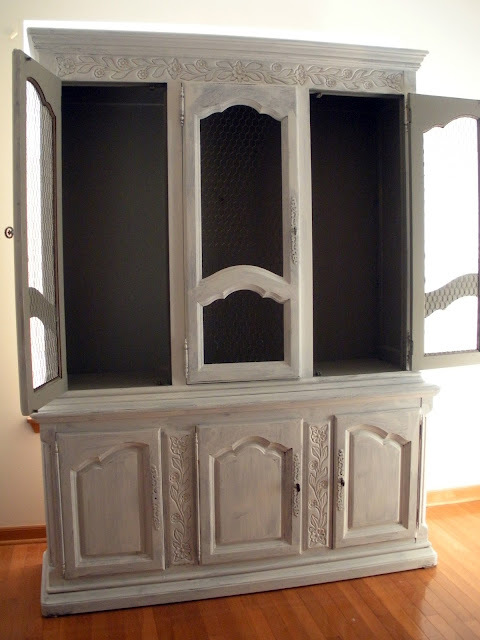 I sanded the cabinet until I was unable to move my limbs. I removed too much paint so I added another coat, skipping spots here and there. I still have to use Clear Wax over the entire piece, then Dark Wax on the details. I'm wondering if there is an Olympic Clear Wax applying event? I'm in training. So sorry to hear about your loss. I felt so much pain when I lost my dogs two years ago that I vowed never to have another. I didn't want to go through the pain once again. But life goes on, and along came another pet and one puts the pain away in a corner of your heart and learns how to love once again. It's a good thing to get busy at times like these. You have done a wonderful job on your hutch. Love it! Hi Divine Theatre. I'm soo sorry for your loss. I lost my pet of 15 years a year ago and still get teary eyed when I thank about her. As always your projects are very interesting. You do keep busy. I hope theses boys don't bail on you on there court date. It is very hard to find good movers. My prayers go out to you. What a stunning transformation! Simply amazing. Sorry to hear about your dog's passing. I understand. Apologies, I meant your cat's passing but typed dog. Nice to see you about again Andie you've been missed. I know you've had a tough time losing people and your babies but keep them in your heart and they'll never be far. I still miss my kitties but get to visit them often out under the blueberries shrubs and I think that's why my shrubs are doing so well, they're tended by my babies. Note to self...stop hiring the stoners....lol. I can't wait to hear that story! I can't wait to hear the story of how the stoners caught your furniture on fire! Nice to see you back! I'm glad you're keeping busy and productive. 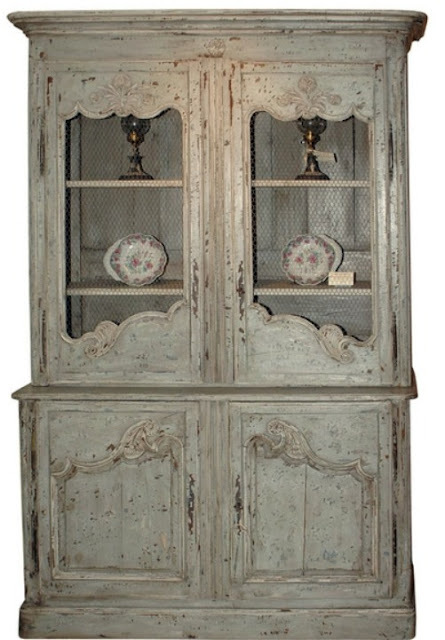 What a gorgeous hutch. Can't wait to see the dark wax on it. Hilarious about the "stoners" and then you rehired them! I can't wait to hear the other part of the story. Just hook it to your cordless drill and buff away! It will buff out the piece to a beautiful shine in no time and do a much better job! Your arms will thank you! 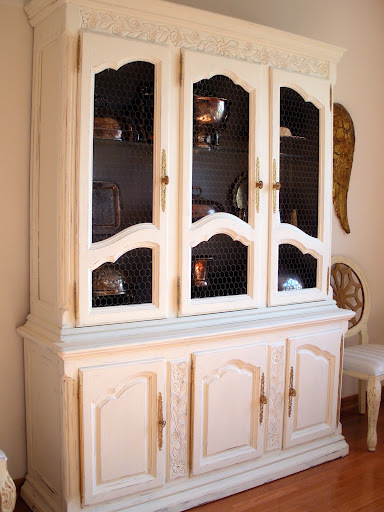 Love it, love the painted glass trick. Richard from My Old Historic House. Really, really excited about your projects! I always click on your blog hoping for a new post that will blow my mind. I don't know how you always manage to make things look so good. If I try the same, it looks like an amateur was at work. You have a great eye for color. Gorgeous! Lots of hard work, and it shows. Perhaps you influenced the kids to be more productive?